A conversation over Xbox Live led to the arrest of a young man threatening to shoot up his high school. 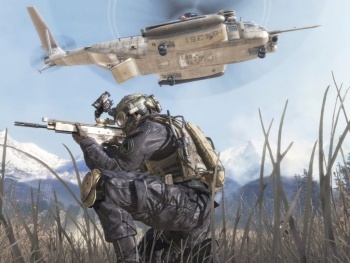 A man living in Port Alberni, British Columbia happened to be playing Call of Duty 2: Modern Warfare over Xbox Live when he heard a shocking admission. His fellow player was failing school; he had drawn up a hit list and made detailed plans for a school shooting he would carry out the next day. The man, disturbed by the admission, questioned the player further but the conversation ended abruptly. He immediately contacted Royal Canadian Mounted Police, who in turn launched an investigation, drawing aid from Microsoft Law Enforcement Security who tracked the young man to San Antonio, Texas. The information was then passed to the San Antonio Police Department, who arrested the suspect. "This incident demonstrates the power of the electronic world and how different enforcement agencies can quickly work together to protect the citizens they serve, regardless of obstacles such as international barriers," Mounted Police Staff Sgt. Lee Omilusik said. "In this case, the suspect was quickly arrested and no one was hurt thanks to the information received from a concerned citizen." After an investigation, police determined the suspect wasn't serious about the threats, and have charged him with making a false alarm or report, a felony in San Antonio. The school as issued a short message to parents that the suspect will be removed from school indefinitely.